← American-modified premier bringing genetic modification? US bridgehead: Are the Canary Islands becoming the Miami of Africa? A look at the world map shows the great significance of islands – from Newfoundland to Malaysia, from Cuba and Haiti to the Azores – in the geopolitics of empire as bastions over strategic straits, bridgeheads and “stepping stones” from one continent to another and one from one sea to another, as repositories of labour and centres for plundering the world ocean, and play-grounds for the idle rich of the metropole. Now, in the context of the aggression against Libya in North Africa and the feverish expansion of its new African Command (Africom), Washington has its sights set on making the Canary Islands a U.S. commerce, tourist and military outpost, from which to exploit Africa. (June 20, 2011) – THE front-page photo of a Venezuelan newspaper from 1949 shows a group of 160 immigrants from the Canary Islands dressed in very humble clothing aboard the La Elvira barge as they awaited clearance to enter the country from the Venezuelan government. The Franco dictatorship in Spain kept the whole country backwards for decades but it was even worse in the Canary Islands whose residents struggled to survive. When Franco died and Spain began a process towards democracy, the economic situation in the Canaries improved, and it was much praised. The Canary Islands are a Spanish archipelago located just off the northwest coast of mainland Africa, 100 km west of the border between Morocco and the Western Sahara. The Canaries are a Spanish autonomous community and an outermost region of the European Union. The islands include: Tenerife, Gran Canaria, Fuerteventura, Lanzarote, La Palma, La Gomera, El Hierro, and the islets La Graciosa, Alegranza, Montaña Clara, Roque del Este, Roque del Oeste and Isla de Lobos. The archipelago’s beaches, climate and important natural attractions, especially Teide National Park and Mount Teide (the third largest volcano in the world), make it a major tourist destination, especially Tenerife, Gran Canaria and Lanzarote. Lots of this praise for the modern Canary Islands came from the US Chamber of Commerce in Spain especially its division in the Canaries. The US Chamber of Commerce website highlights the contribution from the local tertiary sector (representing 80 per cent of all revenue), mainly from trade and tourism (with a population of just over 2 million, the Canary Islands receive some 9 million visitors a year). The US Chamber of Commerce in Spain also notes rising exports from the Canaries to Africa and Asia, aimed towards directly penetrating Western African markets. The islands boost a solid infrastructure that includes 8 air terminals and 41 ports; it is a major receiving point for numerous submarine cables to attract international telecommunications companies and also has a highly educated workforce fluent in other languages (especially English and German). With these advantages, Washington sees the Canaries is a trampoline for trade towards the African continent. The president of the US Chamber of Commerce in Spain, Jaime Malet, says that there exists an opportunity to convert the Canaries into the type of city Singapore is for Asia and that Miami is for the Caribbean. An air transportation center for travel between the United States and Africa. US Ambassador in Spain Alan Solomont has spoken about the priority of reaching out to an African market with some 800 million inhabitants, and as the Canaries as a logistical platform for US projects in Africa. He went on to state that the Canary Islands have the conditions in place to become, in a short timeframe, a logistical center for telecommunications and as a marine transportation hub for trade with Africa; and in a medium timeframe it could become an air transportation center for travel between the United States and Africa. Broadly speaking, this is the conclusion of a study presented to the Canary Government in April. The report, an initiative of the US Chamber of Commerce, explains in detail several advantages that make the archipelago a competitive site to establish businesses. Autonomic authorities, headed by the Canary Coalition, think that these plans are a direct solution to one of Spain’s most pressing problems: employment. Nowadays, Spain has an average unemployment rate of 20 per cent and, in the autonomous regions, the Canary Islands is the worst with 28.5 per cent unemployment. According to Malet, something that “could help” would be to turn the Canaries into “a center of headquarters that offer services to the different subsidiaries settled in the area.” Likewise, it could have a logistic center that distributes, assembles or even manufactures components such as spare parts for cars or medical equipment. To do so, there would be abundant local labor available. To make it even more appealing, there is the also the possibility of receiving thousands of Americans every weekend, in addition to the usual European tourists. The specialists sent by Washington for its special “discovery of Africa” and the personnel of the US embassies in the region would leave the continent periodically to “relax” in the 575 hotels, six casinos and 20 golf courses of the Islands. There are other elements that are also boosting local enthusiasm. According to the study, summarized in the website of the Canary Government, the Islands’ ports, which already connect with more than one monthly frequency to all inlets of West Africa, have very competitive tariffs and handle a considerable volume of imports and exports, which could increase at short term, while connections with the big international lines increase. “Once the Canaries’ air connectivity deficit is solved, there will be conditions for the region to reach all the potential offered by its inherent advantages, including its geographical proximity, its European climate of stability and security, its fiscal regime, its infrastructure, its quality of life and the talent of its people,” added Eugenio Prieto, president of A.T. Kearney, one of the agencies in charge of the study. Although the news reports do not mention it, a multiplied US presence in the Canary Islands would not be complete without a military presence. In the Canaries, there are two important military bases: the air base of Gando and the naval base of Las Palmas, both in Gran Canaria. The two bases are Spanish and therefore they are at NATO’s automatic disposal. So far, there are no exclusively American military bases. The closest is in Morocco, in the locality of Tantan, a few hundred kilometres to the East of the Lanzarote Island. In a conversation via e-mail with JR, Teodoro Santana, member of the Press Secretariat of the Revolutionary Party of the Communists of the Canary Islands (PRCC), refers to this aspect, which has been barely touched. “For several years Juan Verde, a Canary based in the United States, who says he worked as an advisor to the Clinton administration and is now working for Obama’s, has been working in our archipelago. Thanks to his work, he created the US Chamber of Commerce in the Canary Islands, subsidiary of the US Chamber of Commerce in Spain, which is at the same time a subsidiary of the ‘US Chamber of Commerce’ lobby. – Do Canary Islands people know about these plans? 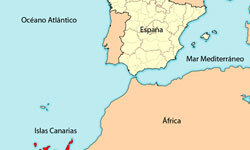 “The Canary Islands people know practically nothing about the US plans for the archipelago. Only the upper echelons of the local oligarchy know about it because they see them as a business opportunity. “Most of the Canary Islands people have been dreaming about being ‘European’, living with their backs turned to our continent. It is understandable: Africa is only seen as a hell of poverty, hunger and suffering, and Europe as the non plus ultra of wealth and well-being. “On the other side, the local TV and press barely pay attention to this topic, and when they do, they present it as seen by the Islands’ oligarchy. Nonetheless, if people know about it, they would think it is OK: 600 years of colonization and the deformation of the conscience that causes the monoculture of tourism develops a servile spirit. What do they care if they have one master (the EU) or another one (the United States)? JR also tried to get an official opinion from Washington about their strategy regarding the Canary Islands, but the answer issued by the Canary Government Information Office was evasive, “We inform you that your question exceeds the competences of this Information Office…We are sorry, we cannot help you.” None of the virtual offices of the Canary Coalition in the seven islands answered our question. We will keep our eyes open. On Sunday, when the Movement that has shaken all of Spain also takes to the Canary squares, we will see if the Canaries have something to say about this matter. The international boundary of the Canaries is the subject of dispute between Spain and Morocco. Morocco does not agree that the laws regarding territorial limits allow Spain to claim for itself seabed boundaries based on the territory of the Canaries, because the Canary Islands are autonomous. The people on these Islands are peaceful, poor, friendly with little crime and now the Business opportunist are hiding their intentions to exploit and think of themselves as saviors, The United States wants to cash in and upgrade the area for military purposes without a care in the world (thinking like they are the peace keepers of all humanity, but full of themselves and greedy as hell) and you use the Miami as it is a good thing, when Miami is Sh,,, t hole. The people will become over taxed if they become a part of the EU (different tax structure and offsets much of their cost by big margin his is disgusting), crime and all that comes with it, which is the other side of an opportunity. These grand plans are being kept in the dark from the people on these Islands and you opportunistic jerks are going to take advantage and destroy their way of life. Another words, you feed them a bunch of bull to make it sound wonderful about what this will bring for them and not telling them of the real consequences because of your well planned deceptions based on your own greed. What a bunch of pathetic and ruthless crooks that do not care but to lie and line your own pockets with money at the cost of their poor, but peaceful lifestyle and you know it. I Think it’s great plans, I hope it will go thru! Jobs and better life for everyone! The reconquest of Africa is a great plan? We are talking Islas Canarias not Africa as a whole continent! Creating a NATO base, airport hub from USA to Africa etc at Gran Canaria Islands is a great plan, Yes! Making the canaries a target for the War they are trying to start with Russia and China.